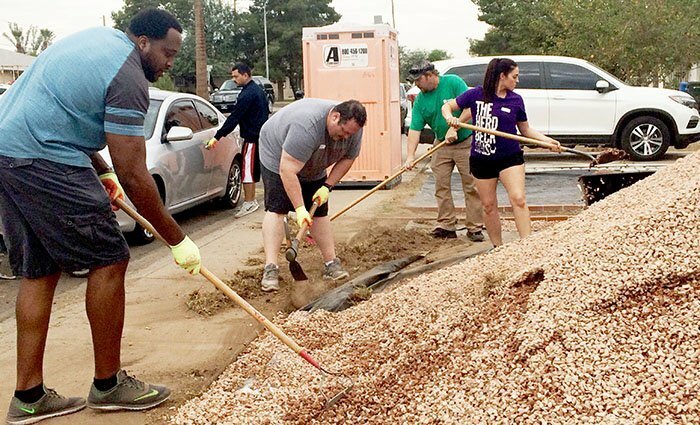 GCU employees Gaby Ngoundjo, Matthew Holemon and Jenelle Lake (front, from left) volunteer for a Habitat for Humanity landscaping project recently. All three also participate in Donate to Elevate, in which GCU employees allocate a portion of their tax dollars to Habitat, School Choice Arizona or public/charter schools’ extracurricular programs. It’s 7:30 a.m. on a crisp, cloudy Arizona morning. But you couldn’t call the team of GCU volunteers gathered at a home on Montebello Avenue little rain clouds. 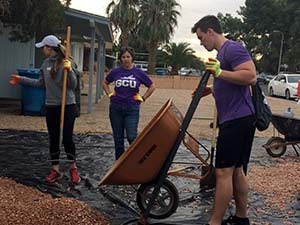 Instead, they added a bright hue – and a lot of purple – to the west Phoenix neighborhood, just a few blocks away from the campus. It’s where the team spent the morning replacing the grass lawn with a desert-friendly rock landscape and planting flowering silverbush and other heat-hardy greenery. It was just one in a shower of projects GCU has tackled as part of its partnership with Habitat for Humanity Central Arizona – unique in that, instead of building a home for someone who might not otherwise be able to afford a house, residences in the Canyon Corridor are being renovated as part of Habitat’s Neighborhood Revitalization Initiative. GCU and Habitat for Humanity want to renovate 700 homes in the neighborhood around the University in the next three to four years. Employees can allocate a portion of their tax dollars to go to Habitat, School Choice Arizona or extracurricular programs at public/charter schools. It’s an initiative that fits perfectly with GCU’s dedication to missional work and transforming the neighborhood it calls home. It’s just one of the ways the University has dedicated itself to Habitat. But big machine of volunteer manpower aside, GCU also embraces the home-building organization through Donate to Elevate. Employees can designate a portion of what they would ordinarily pay into their state taxes to Habitat for Humanity or School Choice Arizona to support scholarships so students can attend private Christian schools. Both choices can be made through GCU payroll. Employees also may choose a third option, to support public/charter school extra-curricular programs, such as the arts, after-school tutoring or athletics programs, though this is not available through payroll and is done by visiting individual schools’ websites. The allocation, a dollar-for-dollar tax credit, does not affect employees’ take-home pay. GCU’s goal is to reach $2.5 million of allocations by March 31, though pledges will be taken through the end of 2018. The University has reached 55 percent of that goal, said Sheila Jones, Program Manager for Strategic Educational Alliances and Donate to Elevate. Homeowner Eric Hernandez, whose family moved in just a year ago, heard about the Habitat initiative after reading a flyer left on his door. The GCU volunteer team, who gathered together from different university departments, dug holes for the plants ready to go into the ground. Habitat provides four desert-hardy plants that fit in with its water-conservation efforts. And they laid down tarp before layering landscaping rock over it. GCU corporate paralegal Stephanie Pearlman (center) has participated in Donate to Elevate for three years. Habitat Volunteer Services Manager Luz Aguilar-Johnson, whose daughter attends GCU online, signed in the project’s volunteers and took a group photograph before the day’s work started. She has been with the organization since 2007, the same year she was in the process of getting a Habitat home. Jenelle Lake, a university enrollment counselor in the military division, said she has been participating in GCU’s Donate to Elevate ever since she started working for the University 3½ years ago. Hernandez’s home was the sixth Habitat project in which she has been involved. She often volunteers with fellow military division enrollment counselor Gaby Ngoundjo, who has been at GCU for nine years – six as an employee and the rest as a student. Originally from Africa, he came to GCU to play basketball. “I bleed purple,” the 6-foot-8-inch Ngoundjo said with a smile. He volunteers for a Habitat project about once every three months. Like Lake, he also participates in Donate to Elevate. 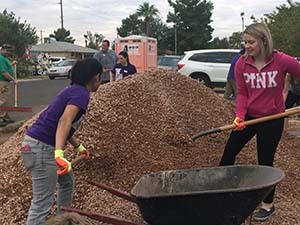 The Montebello Avenue home was Matthew Holemon’s second Habitat Neighborhood Revitalization Initiative project, though he has led a Habitat crew before as a GCU student. “It’s fun to do real (physical) work instead of just working on paper,” said Holemon, an internal auditor with GCU. He has designated part of his state taxes through Donate to Elevate ever since the program made its debut at GCU in 2013. “Giving is important as part of GCU’s mission, and it’s my personal mission to donate to those less fortunate,” he said. Donating through GCU makes it much easier for him to fulfill that mission, he added. Donation limits for employees wanting to designate a portion of their tax dollars to Habitat for Humanity are $400 for single taxpayers and $800 for those married filing jointly. To participate in Donate to Elevate, fill out the pledge form (whether renewing or joining in the effort for the first time). Here’s a video on how to fill out the form. Employees may allocate $400 if filing single and $800 if married and filing jointly to Habitat. They may allocate $555 if filing single and $1,110 if married filing jointly to School Choice Arizona. The donation limits are $200 for single filers and $400 for those married filing jointly for public/charter school donations. For more information about Donate to Elevate, go to this link, email donatetoelevate@gcu.edu or call 602-247-4000.